It is well known that The Allagash Wilderness Waterway area has a very rich history of lumbering and farming. A visit to this area may be on the waterway or on the many roads that traverse it. In your travels, it is more than likely that you will encounter a place with a name that is both unusual and somewhat intriguing. Having canoed the Allagash River with family and friends for over twenty-five years and hunted this area for even longer, I became very interested in the meanings and origins of such places. After consulting with several excellent resources, I learned that some names were extremely difficult to identify and would date back to the early 1800s. I believed it was of great importance that these findings be brought together and documented for future generations. general location of the explicit ones. Also included in this guide are 35 historical sites along the waterway. These sites and the Allagash Wilderness Waterway campsites have their G.P.S. coordinates listed in U.T.M. format in the back of the booklet. The historical areas begin with The Telos Dam and Cut, continuing on to Casey Rapids in the Town of Allagash nearly 100 miles to the north. I hope this guide will be informative and educational as you travel up or down the waterway and nearby areas. 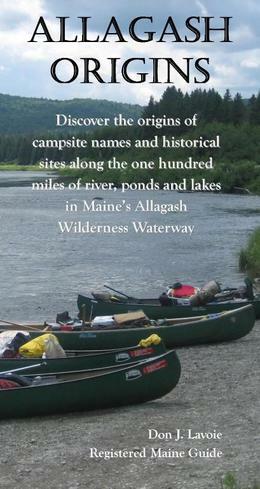 Discover the origins of campsite names and historical sites along the one hundred miles of river, ponds, and lakes in Maine's Allagash Wilderness Waterway.